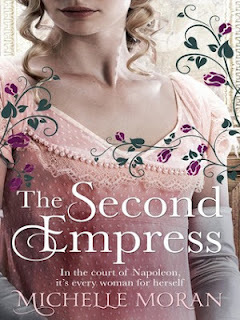 The Second Empress is set in the final years of Napoleon's reign, when at 40, he divorces the allegedly unfaithful Josephine and takes the 19 year-old Maria-Lucia of Austria as his wife to provide him with a male heir. Napoleon’s sister, Pauline, is a driven, outrageous character who, having just rid herself of Josephine, now has to contend with an Austrian princess with an ancient title rather than an invented one. Pauline is obsessed with her brother and believes they should rule the empire jointly like the ancient Egyptians. The reader is left in no doubt that Maria-Lucia is to be sacrificed to save her country and Napoleon’s ambition for a legitimate heir – no pressure there then for the poor girl! Marie-Louise accepts her fate with the dignity of a Hapsburg Princess raised to a life of duty, while Napoleon, a military genius but completely inept when it comes to relationships, seems to think this pretty teenager will be overawed and honoured to be shackled to a podgy, balding middle-age-man [that is-by early 19th century standards]. Marie Louise is in love with Adam Neipperg, an Austrian Count who is her lover, and is heartbroken to leave him behind, but he and her father promise to come for her. When is not specified, but the implication is that once she has given Napoleon a son, this may be achieved. Pauline is certainly determined that is the way things will go. Marie Louise has little to say to her new husband, or at least nothing she hasn’t been coached to say to maintain the man’s fragile ego – she strikes up a friendship with Hortense, Josephine's daughter, who is now free to leave her husband, Napoleon's brother. However she has also been made Mistress of The Robes to the new empress, a cruel decree of her stepfather’s, which makes Marie Louise’s life slightly more bearable, but she still has to contend with the jealous Pauline. After Napoleon's defeat in Russia, when he is banished to the island of Elba, Marie-Louise is free of him, but when he escapes, she is not sure what this will mean for her own future. I really enjoyed reading this story, it’s one of those novels where I couldn't wait for a quiet hour so I could read what happens next. What will the vicious Pauline do to embarrass Marie-Louise and will Queen Caroline show herself up as a Corsican peasant beneath all her furs? The story doesn’t get bogged down with military manoeuvrings, territorial claims or battles either, all of which tend to happen in the background, but concentrates on the dynamics of Napoleon’s court and the women who vie for his attention. Sumptuous gowns, jewels and pretty women proliferate, [Napoleon doesn't like them plump or tall] which tallies with the early nineteenth century belief that females were considered weak minded, and only capable of functioning as ornamental consorts for their husbands. When Marie-Louise is told she is to marry Napoleon, the greasy Prince Metternich says she'll have more furs and jewellery than any ruler in Europe – as if bling made up for a lack of breeding. The novel is written throughout in first person, through the alternating points of view of Maria-Lucia, Pauline, and Pauline's Haitian chamberlain, Paul. I found this distracting at first, as once or twice it is not explained whose PoV we were in, so could be confusing, but give a different perspective of the characters. Although the immoral, and outrageous Pauline is not a pleasant character, I couldn’t help admiring her ruthless determination to have her way, the depths she was willing to plunge to obtain it despite her own declining health. I’m English, so Napoleon painted as a callous megalomaniac whom absolute power has corrupted absolutely – who strives to be more royal than the royals by giving all his siblings crowns, and spends more money on pageants and pomp than the Emperors of Rome ever did; was what I was taught in school and I’m not willing to change my opinion now! This is a fascinating, well-crafted and enjoyable novel which gives a different perspective on Napoleon’s later years. One chilling passage which was taken from his letters, many to Josephine after their divorce, was his report from Russia that half a million Frenchmen had been killed, but writes in the third person that: 'The Emperor's health could not be better!' A monster indeed.